The latest In Death mystery finds Eve Dallas standing over the body of a man who has been extensively tortured. Close examination reveals a heart outline with the initials E and D inside it carved into the victim’s skin. Eve doesn’t yet know that she’s looking at the latest victim of a pair of spree killers who consider torturing and killing an aphrodisiac. As Eve investigates, she discovers other victims who appear to have been killed in the same way, some with the carved heart and some without it. She begins to realize there are many potential victims, and the arrival of a deputy sheriff from the Ozarks, who’s on this couple’s trail because of people they killed in his community, provides information that adds more victims to Eve’s tally. The plot is nicely layered, with discoveries leading slowly to the killers’ identities, and enough dead ends and false starts for the case not to seem too easy. The pace was fast enough to feel solid but not so fast as to omit important information or shortchange big moments. The people who knew the victims are sketched in enough detail to make them seem real but not so much that they have a chance to take over the scene. Deputy Sheriff Banner is an engaging and sympathetic character. While he’s not part of the NYPSD, he was a fun addition to the story, and he has an interesting encounter with Roarke. The aftermath of it demonstrates the continuing evolution of Roarke and Eve’s marriage. The way characters become more or less prominent in a given story, depending on their roles, keeps this series from feeling stale. This time around, detectives Santiago and Carmichael stepped to the foreground. With everyone awaiting Officer Trueheart’s results on the detective’s exam, Baxter and Trueheart dropped into the background a bit. Baxter did, however, have some very nice moments of concern for the young officer. Robb further develops the character of Dr. Garnet DeWinter, whose relationship with Eve remains a bit uneasy. One of the joys of this series is the way Eve Dallas has grown as a character and her relationships with others have developed. Robb doesn’t rush these changes but lets them happen organically, as they might if these people were real. So while Eve and DeWinter are moving toward a better relationship, they’re still dancing around each other to a degree. One of the most appealing parts of this particular story was the way two of the killers’ captives responded to their situation and tried to support each other despite the horrendous physical and emotional damage inflicted by their captors. At the same time, scenes in their points of view heightened the sense of time running out. The NYPSD’s takedown in this instance was particularly satisfying. In any long-running series, some books will appeal more to particular readers than others. For me, Devoted in Death ranks among the best of the In Death novels. I really liked Deputy Banner - hope he pops up again in another story. I've not read her In Death series although I have some in my tbr pile. My question is: should these be read in order? Catslady, I haven't read them either but friends who have say it's best to read them in order because Eve and Roarke, individually and as a couple, evolve over the course of the series. That's what I was afraid of lol. 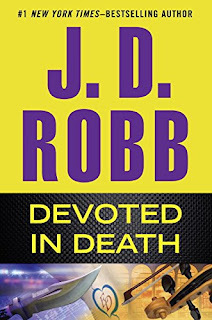 Catslady, the mysteries stand alone, but the evolution of Eve's character and, as PJ's friends say, of Eve and Roarke's relationship, is easier to appreciate if you read in order. I just started it today. JDR never disappoints.